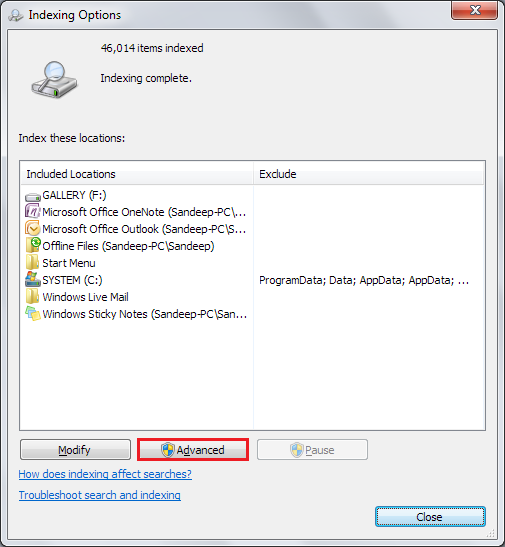 In this guide, I will explain how to fix windows 7 search, if it’s not working. 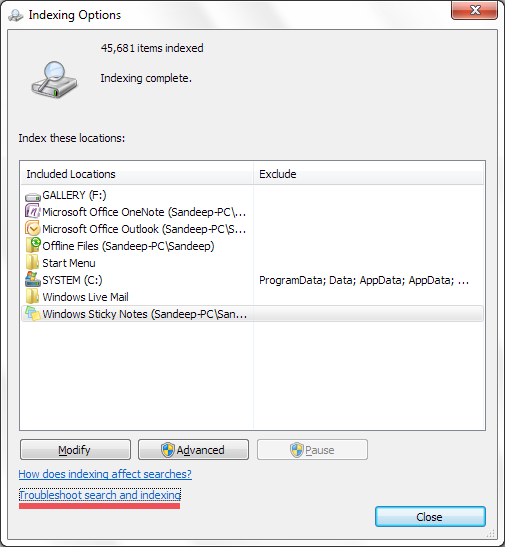 The search is one of the useful features of windows, you can search all of your files & gets quick results. However, if there is an indexing problem, it won’t show any results every time you type a keyword into the search bar. Here is what you need to do to get it work again. Step 1: Open Control Panel from start, then navigate to Programs and Features. 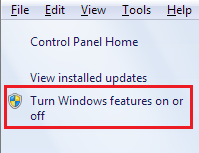 Step 2: Once you get in Programs and features window, on the left pane click on “Turn Windows features on or off”. Step 3: The Windows Features dialog will appear. Scroll down to find “Windows Search” and make sure it is checked, then click ok. 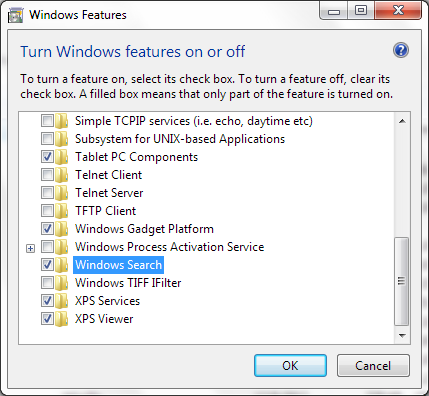 If the above method does not work you can try fixing it through windows troubleshooting. Step 1: Click on Start and type index then select Indexing Options from the list. 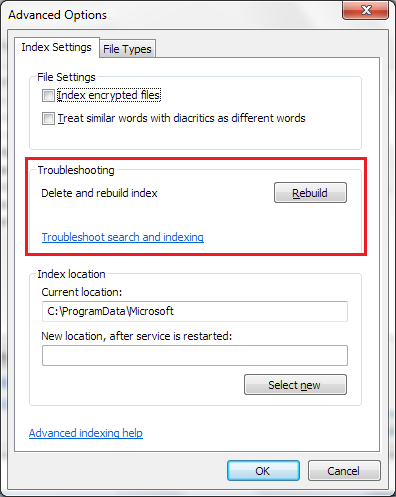 Step 2: It will open the Indexing Options window, at the bottom Click on the link to “Troubleshoot search and indexing”. 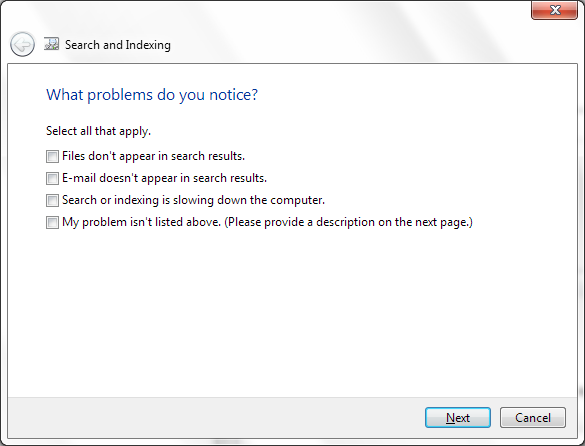 Step 3: On the Search and Indexing screen, select one or more of your problems & then click next, wait for Windows to solve the issue. Sometimes the indexing of files gets disconnected and messed up. So rebuilding the index may fix it in some cases. Step 1: Click on Start and type index, then select Indexing Options from the list that will appear. Step 2: It will open the Indexing Options window. Click on the Advanced Button. Step 3: On the Advanced Options dialog box, select the Index Settings tab, and then click on Rebuild button. 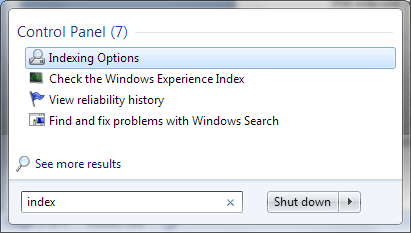 After following this tutorial you should be able to know how you can troubleshoot search problems in Windows 7. Thanks alot worked for me great article author name please ?